L. Wayne Freeman, M.D., has lived in Southern California all his life. He completed his undergraduate studies in Public Health at UCLA, receiving a B.S. degree in 1971. The highlight if his time at UCLA was being a starting guard on the undefeated freshman basketball team. He continued in Medical School at UCLA, obtaining his MD degree in 1975. After a general surgery internship at Harbor-UCLA in Torrance, he moved to Long Beach in 1976 to begin his Ophthalmology residency at UC Irvine. In 1979 he received his Eye Specialty Certification and went on to do a fellowship in cataract surgery and lens implants in Arizona with one of the World’s leading eye surgeons. He became a certified Fellow of the American Board of Ophthalmology in 1980. 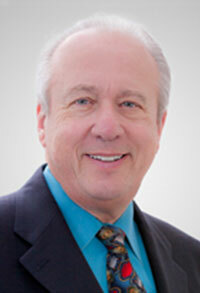 Dr. Freeman then began private practice providing general ophthalmology. He has been a teacher and a mentor for residents in training as well as other ophthalmologists. He has been on both the clinical teaching faculties at UC Irvine and the Long Beach VA medicine Center. Dr. Freeman has been extremely active in working to maintain the highest quality medical eye care in the community. He has been chairman of numerous committees and departments at Los Alamitos Medical Center including Chairman of the Departments of Ophthalmology and Surgery and served as Chief of Staff in 2000-2001. He has been a member of the Governing Board of Los Alamitos Hospital for many years and became Governing Board Chairman in 2006, serving a two year term. Presently he serves as the long standing Chairman of the Safety Committee at Los Alamitos Medical Center. He lives in Long Beach with his wife Karen Braverman-Freeman, a costume designer and artist, and has three children of whom he is so proud – Aaron, Jana and Samantha. Dr. Freeman’s hobbies include music – he plays classical and rag time piano on his restored 1926 Steinway player piano. He is also an avid golfer and has played most of the top 100 golf courses in the US and the World.